It was in November 2017 at the EICMA motorcycle show that Royal Enfield had showcased the Continental GT 650 and the Interceptor 650. These two motorcycles are the first parallel-twin engine models that the company has manufactured and also the most powerful Royal Enfield bikes ever. At present, Royal Enfield is one of the most profitable motorcycle manufacturers in India and it is looking to grab a substantial share of the 350 cc to 700 cc segment globally. The Royal Enfield Continental GT 650 and the Interceptor 650 will spearhead the sales in the segment mentioned below and also help the company occupy a big space in the global market. It will be one full year since the bikes were showcased and till they are launched in India. Here is everything that we know about the bikes so far. The Continental GT 650 and the Interceptor 650 use the same 648 cc parallel-twin motor. The engine makes 47 bhp at 7,100 rpm and 52 Nm at 4,000 rpm and is mated to a 6-speed gearbox with a slip-assist clutch. The engine gets a 270 degree firing order, which the company found to have the smoothest setup and feel. The engine is air-cooled, of course and like typical Royal Enfield motors, is expected to offer solid grunt in the mid-range. The bikes will have dual-channel ABS as standard, which is great news! The underpinnings consist of a dual-cradle, tubular steel frame which was developed by Harris Performance (A company owned by Royal Enfield). The bike gets 41 mm telescopic suspension up front which has 110 mm of travel. At the rear, there are twin coil-over shock absorbers with 88 mm of travel. The bike weighs 198 kg (dry). Up front is a 320 mm disc while the rear tyre gets a 240 mm disc. There is a retro-looking twin-pod instrumentation console which has analogue meters for measuring speed and RPMs. There is a small digital panel for showing other information as well. We believe there will not be an option to turn the ABS off entirely. 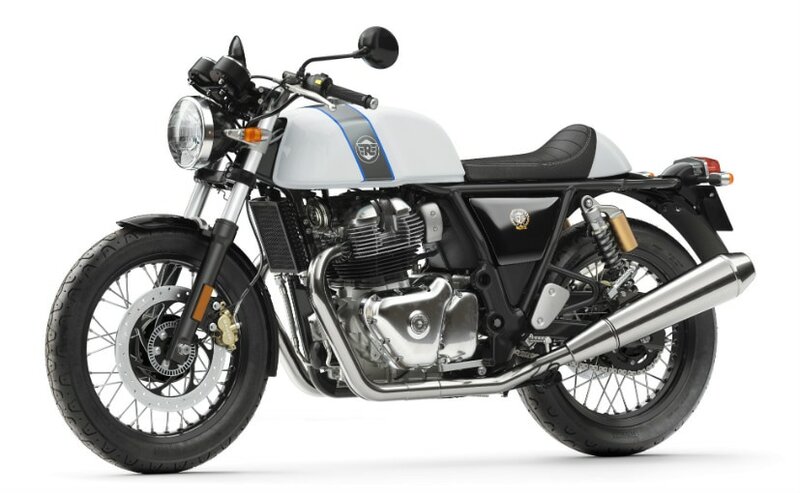 The Continental GT 650 and the Interceptor 650 will be offered in multiple colours and Royal Enfield says that these two motorcycles will be one of the best ever from the company in terms of fit and finish. Royal Enfield will also be offering a whole bunch of modular accessories for the Continental GT 650 Twin and the Interceptor 650. Some of them will be a lower clip-on handlebars, twin-seat, fly-screen and so on and so forth. These accessories will be designed to be inter-changeable between the Interceptor 650 and the Continental GT 650, meaning you can use the same accessories on both models. Similar to most premium motorcycle brands, Royal Enfield too has its fair share of loyal customers. Not only is Royal Enfield looking to offer existing customers an option to upgrade but also entice customers who were looking to invest money into brands such as KTM, Benelli, BMW Motorrad’s small bikes and so on. Therefore, we expect the pricing of the Continental GT 650 and the Interceptor 650 to be between ₹ 3.5 lakh to ₹ 4.2 lakh (ex-showroom).